HomeResourcesWhitepapersAI in HR: Job Threat or Business Growth Opportunity? Job Threat or Business Growth Opportunity? Artificial intelligence (AI) is coming to the mainstream—and HR will feel the impact. 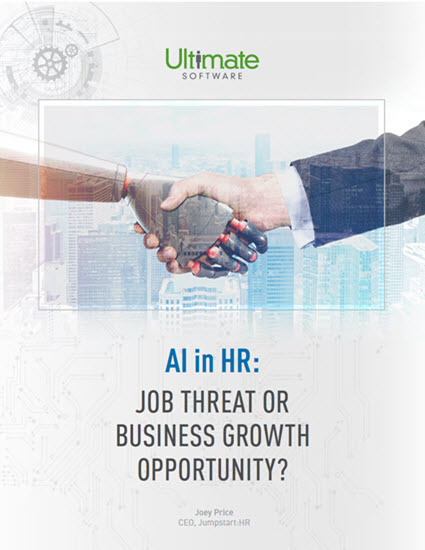 There’s a lot of fear, uncertainty, and doubt about artificial intelligence (AI) and the impact it will have on HR professionals around the globe. While the workforce is undoubtedly changing due to the impact of automation, AI has enormous potential to assist the human aspect of human resources. The introduction of AI in the short term will be disruptive to the status quo. But the traditional HR model is in need of a shake-up, and emerging technologies are likely transform and improve the workforce, rather than replacing it. In this whitepaper, Joey Price walks us through the upcoming revolution driven by AI, cognitive computing, and related tech, and adds his predictions on the future of HR. Please fill out this brief form to access your whitepaper.